In the most ideal scenarios, the default place for the photographer is one step back from the action, assuming a non-intrusive, observational position. Once that’s secured, there are varying degrees of influence, predetermined or resulting naturally, that weigh into any given situation i.e. Why are you there? What’s the brief? What are you responding to or distracted by? What’s the attitude of the subject? What does the client need? What do you want to say? …and in all these multifaceted challenges, from technical to interpersonal, come those instances where the story takes over, where the photographed and the photographer, momentarily forget their parts. The image above is part of a series promoting the work of Uniting and their Newpin program which supports positive parenting skills. 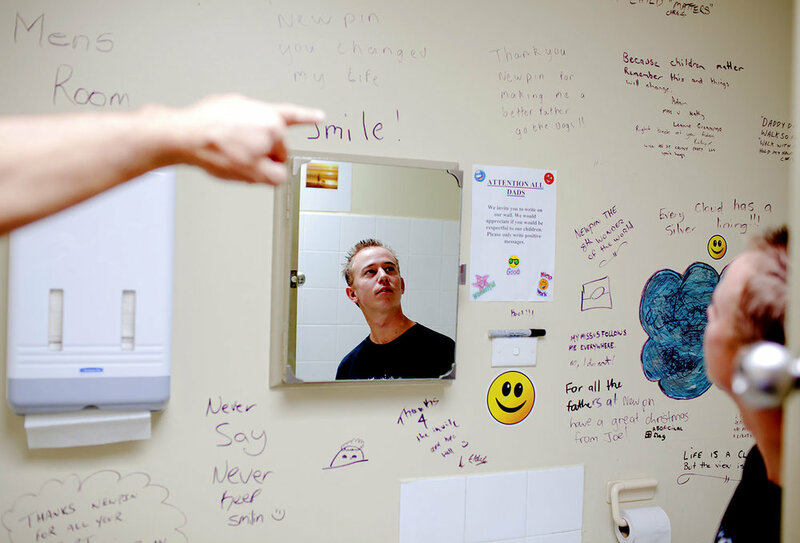 Assisted by a health worker– whose arm appears in the picture– during a guided tour of the house the young father reflects on the toilet graffiti, a wall of gratitude. It is an example of a most unlikely place for a portrait and an instance where the environment symbolises much more than any look or human gesture.